One of the things I've enjoyed most about my first year as an author has been meeting new friends with similar interests, whether that's writing, baking, tea-drinking, coffee-roasting, massage therapy, or in the case of Katherine McIntyre, all of the above! Katherine is a new to me author whose body of work includes fantasy, romance, steampunk, and young adult novels that sound so amazing to me that I'm surprised I haven't already read them all. 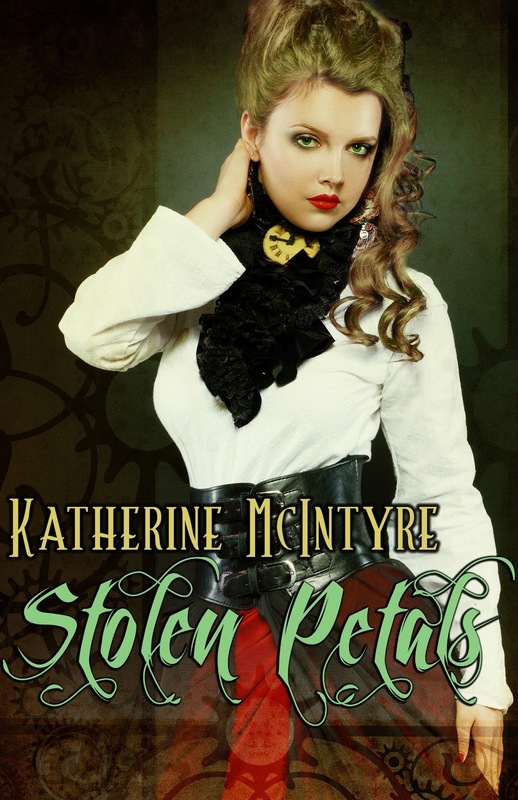 I am thrilled to welcome Katherine to the blog today to talk about her life as modern day Renaissance woman and her latest steampunk adventure, Stolen Petals. At the moment, I actually happen to be drinking one of my blends iced. It’s a panfired green tea with lemon peel and lavender. I’m a bit of a lavender junkie and this is proving to be a phenomenal thirst quencher! You’ve blended tea and your website even has special tea blends for each of your books--how awesome! I love drinking tea, but I’ve never blended it before. What’s that process like, and what’s your favorite blend? 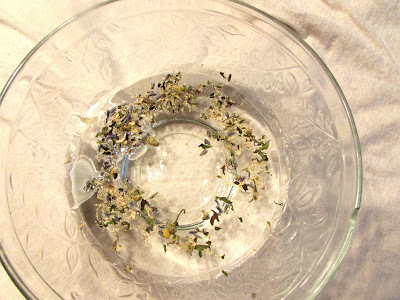 Blending tea is a lot like cooking, where you toss one thing into the pot and another and another because it sounds like it would be good together. However, similar to cooking, most recipes require a lot of trial and error until you reach the right taste for each blend! My favorite blend changes a lot because my tea drinking habits are wildly varied. I tend to get fixated on one blend for a month and then switch to something entirely different. So my current fixation is my By the Sea tea, an herbal blend of lavender, peppermint, and chamomile geared for total relaxation. You’re an author and a massage therapist! Do you find the careers compatible? Wonderfully so! I work on so many different people from all different walks of life and am constantly finding story inspiration through that. Performing massage also puts me in a sort of meditative state, which has helped when I’m stuck on plot problems. It’s like the shower solution—once your mind is clear and calm, the answers arrive more quickly. Your website has some playlists to go with your books--what comes first, the playlist or the plot? I’ll begin writing a story and fairly soon after mesh together a playlist. And since I’m not a heavy planner for my plots, the playlist sort of helps me get focused and combat writer’s block. Each book has a different sort of vibe and music helps place me in that mindset. I have a widespread taste in music, but I wouldn’t say I’m someone who listens to a little bit of everything since I’m quite picky. More recently, I began listening to gothic country, and before that, it was celtic punk, so who knows what I’ll tune in to next. Your books could fall into several categories-- paranormal romance, urban fantasy, steampunk adventure, and even young adult--are there any other genres you would like to write? I’d love to do more young adult actually. As much as I love reading adult fantasy, I have to say my favorite themes all lie in young adult—I adore the self exploration of the individual and how they develop and mature over the span of a book or series. As different as they are, your books seem to have a certain element of fantasy in common. What is it about writing fantasy that you enjoy? Fantasy is such an integral part of my existence. When I was a kid, I was a shy extrovert constantly torn between wanting to reach out and communicate yet being petrified to do so. What gave me reprieve were fantasy books. I dove into them, escaping within the pages and going on journeys with characters who became fast friends. The fantasy genre has all of the drama and themes as any modern story, however, given the nature of the genre we approach it with a more open mind to learning lessons that reflect our own society. Poisoned Apple is a fresh take on Snow White. Are there any other fairytales you’d like to re-write? Oh man, whenever I think of fairytales, the ideas just hit me all at once. I love the old fairytales, but even more-so, I love twisting them. These stories have passed down through the years, and I love examining them from different angles than they were presented to me. In fact, many authors have tackled fairytales before and explored them with rather unique results. Poisoned Apple sprung out of a desire to see what a character forced to go through Snow White’s hardships of a wicked stepmother, the loss of a mother, then a father would be like. Do you think there are there any signature characteristics that make a Katherine McIntyre novel? Are there any subjects or themes you’re particularly drawn to? If you ask my husband, who’s always my first beta-reader, I have a penchant for dramatic speeches. A bit of a fantasy trope, but I love those motivational troop rallying speeches right before folks are ready to head into the final battle. As for themes I’m drawn to, well, I’m an ENFJ at the heart of things, so the idea of people working together to create something beautiful, to overcome obstacles, those ideas thrill me. I also tend to get these adventuring risk-taking urges, and through my characters can experience so much while sitting behind my laptop. Who (or what!) are your biggest influences? My biggest influences were the books that impacted me the most, the ones which sort of shaped what stories I preferred and helped me clarify my values and morals. I can immediately recall three series I read time and time again as a kid: The Chronicles of Narnia by C.S. Lewis, The Prydain Chronicles by Lloyd Alexander, and the Enchanted Forest Chronicles, by Patricia C. Wrede. From there, I developed my love for adventure, for character growth, and for practical, independent women—all three facets manifest readily in my stories. As for other media, I have to say, the Last Unicorn made a huge impact early on when I watched the movie (though the book is phenomenal as well, I didn’t discover it until later in life). Also Joss Whedon shows tend to stir my imagination—I’m a diehard Buffy and Firefly fan. Well, this year’s been a very word count heavy one, so I’m currently in the submissions process for my urban fantasy novella, Hunting for Spring, and I’m working through edits on a creepy winter fairytale, A Reflection of Ice. As for larger projects, I have a novel length manuscript I just finished which is a young adult fantasy with heavy Celtic themes. Probably the most exciting thing on the horizon though is my decision to pen a sequel to An Airship Named Desire. 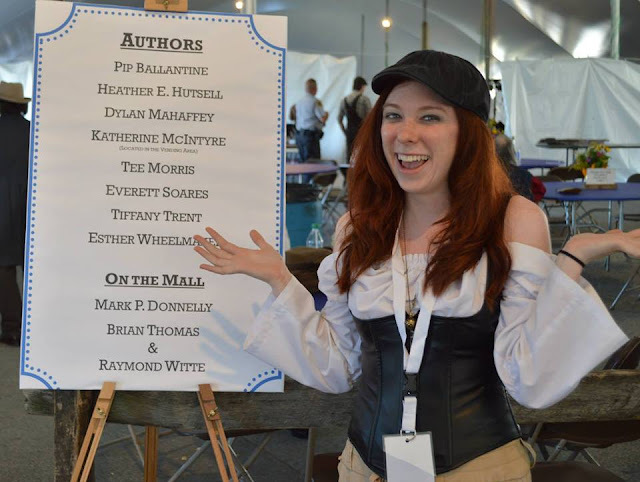 It was my debut novel from 2012, and I’d written it as a standalone, however, after writing Stolen Petals set in the same universe, I got the bug to continue the story of the scrappy band of airship pirates.